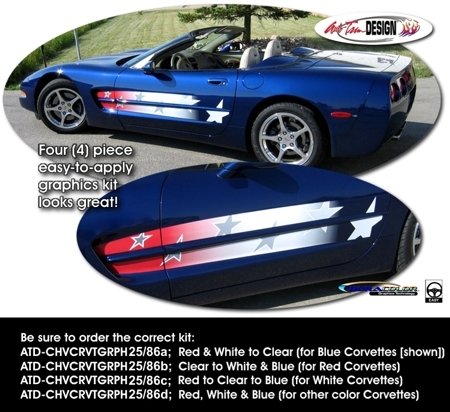 Set your '97-'04 Chevrolet Corvette C5 apart from the rest with this unique Patriotic Body Side Graphics kit. These awesome graphics are designed to fit perfectly within your Vette's depressed vent area. This kit is made specifically for C5's with (split) or without (solid) the center "spear" molding as shown. Starting as Red at the front vent, these graphics gently fade to White then Blue and feature White Stars. For Blue, Red and White C5's, the image is printed on Clear - utilizing the color of your vehicle as the background. Measuring 63.817"x 9.49" (162.10cm x 24.10cm), these graphics are very easy to install and include general online application and care instructions.